Marysville’s Sydney Wade slides safely into third base with a triple as Westland’s infielder can’t catch the ball thrown into the outfield. The Lady Monarchs rolled to a 15-0 victory to open up the Ohio Capital Conference Central Division portion of their schedule. The Lady Monarchs rapped Westland pitcher Katie Miller for 13 hits during a 15-0 victory that ended with the run rule. “We kept our bats going tonight from last Saturday and I hope we continue that,” said Marysville head coach Jennifer Segner-Maxwell. The Lady Monarchs (9-4 overall) put four runs on the scoreboard during the home half of the opening inning. Emily Daniel led off and went all the way to second on the first of eight Westland errors. She advanced to third on a passed ball and scored on Hanna Moffett’s base hit. Izzy Shroyer tripled in a run and Ashley Dunn’s single plated another. The Lady Monarchs took a 4-0 advantage after a single by Lexi Williams and another fielding miscue. Marysville padded its lead with seven runs during the second frame. Sydney Wade led off with a triple and scored on Daniel’s grounder. Moffett, who had missed a number of games with a hand injury, and Abby Gindlesberger both singled. They later crossed the plate on a Cougar error. Leah Potter drove in a run with a base hit and Williams doubled in a score during the onslaught. 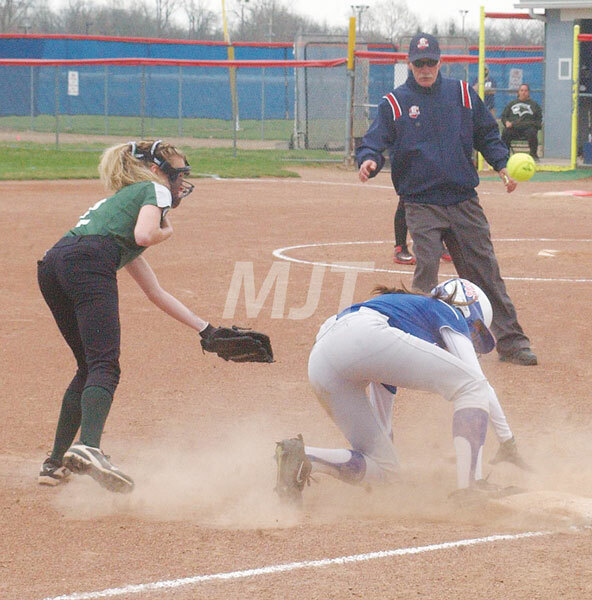 The seventh run of the inning raced home when Westland misplayed a ball hit by Tayler Clabaugh into an error. Shroyer, who started in the pitching circle for the Lady Monarchs, had a fairly easy three-inning stint. The junior southpaw did have a bit of trouble finding the strike zone during the first inning when she walked a couple of batters. Otherwise, the only other blemishes to her stat line came on a pair of harmless base hits in the second and third innings. MHS (which will travel to Central Crossing today) took its 11-0 margin into the top of the fourth as Gindelsberger came on in relief. She put the Cougars down in order with a couple of ground balls and a strikeout. The Lady Monarchs added to their lead with four runs in the home half of the fourth. Westland committed a few more errors, while Jaynn Young, Clabaugh and Wade each hit safely. Gindelsberger returned to the circle in the top of the fifth. She got the first out on a grounder and then put two more punchouts in the book to end the game. Segner-Maxwell was happy with her team’s pitching. The victory came as the Lady Monarchs opened the Ohio Capital Conference Central Division portion of their season. They won the OCC Central crown a year ago with a 10-0 record and have set the goal of defending that title this spring.